Baker, Sir Richard. 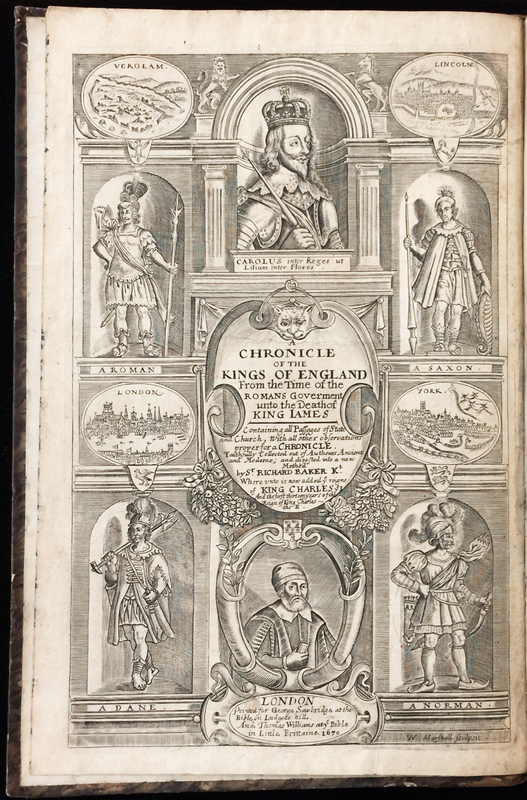 A chronicle of the kings of England, from the time of the Romans government unto the death of King James. London: George Sawbridge and Thomas Williams, 1670. Signature of Morris, Red House, Upton, Kent. Provenance: Morris. — Sotheby 1898, lot 153 (sold to Vigers for £1 12s.). — Percy Lubbock. — H. M. Fletcher. — Sanford and Helen Berger (purchased from Fletcher for £150, 21 June 1985). — Huntington Library (Rare Books 607668). References: Ellis valuation, fol. 48b (5s.). — ESTC (R26672). — MS catalogue (2), no. 474 (where the date is erroneously given as 1770).